To improve bilateral/multilateral relations amongst countries, especially between Indonesia and Malaysia, through the promotion of cultural understanding and awareness, joint projects or adopting best practices of key signature projects. To set up 10 Friendship/Sister club agreements especially between Malaysian and Indonesian clubs. Clubs can start with Joint Projects/Activities first to ensure that chemistry of the members is compatible. 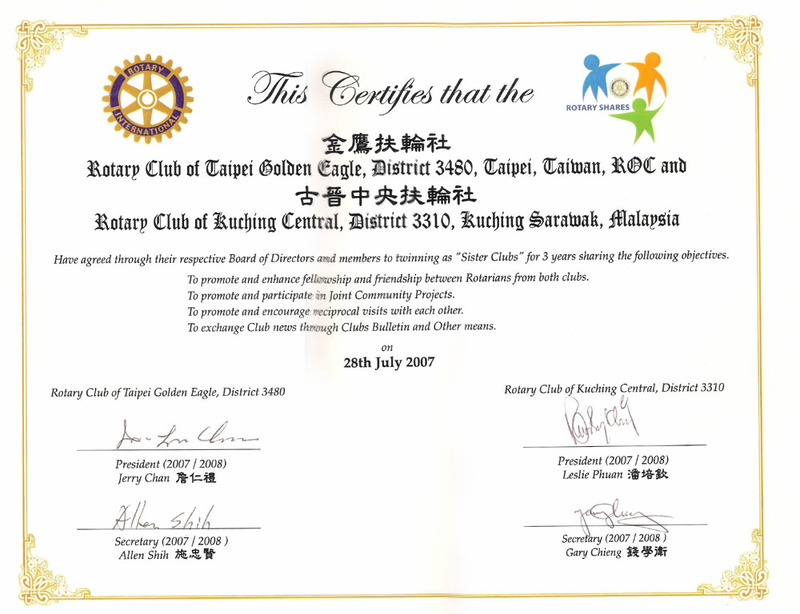 Invite representatives from the overseas clubs to to attend our District 3310 events. Provide standard template agreements for Friendship/Sister relationship. Synergise with district committees such as International Service Committee and World Community Service Committee. Having sister club arrangements is within one of the scope of International Service where such initiatives can create better understanding and goodwill through joint activities and community projects. Clubs need to know their objectives for sister club agreement to avoid possible misunderstanding later. If the initial assessment indicates a possible matched, the next logical step is to make an effort to arrange for a face-to-face meeting. After the meeting, each club should be able to have a feel if it is worth pursuing the sister club agreement. Unless the intended matched clubs already have established prior engagements, it is advised that a joint project should be taken up so that members from the respective Rotary clubs can get know each other before proceeding with any proposal for a sister club agreement. Matched sister clubs must also be willing to reciprocate project funding such that funding for a joint project is not only (or always) provided by one club while the other club is only (or always) on the receiving end. RC Bandung Kota Kembang (Ina Primiana) D3410 & ……..
RC Jakarta Gambir (PDG Rodolfo Balmater) D3410 & ……. RC Purwokerto (Anton Soeparno) D3420 & ……. RC Madiun Raya D3420 (Lusy Tjindrawati) & ………..
RC Jakarta Sunter Centennial D3410 (Fi Njan Susanto) & ………. RC Jakarta Metropolitan D3410 (Widia Dharmadi) & ………. RC Surabaya Kaliasin D3410 (Yetty Puspitawati) & ……..
RC Surabaya Sentral D3410 (Janti) & ………..
RC Yogyakarta D3410 (Puguh wahyu) & ……..
RC Jogja Merapi (Ida Nur Rubia) D3410 & ………. RC Jakarta Cinere & ……..